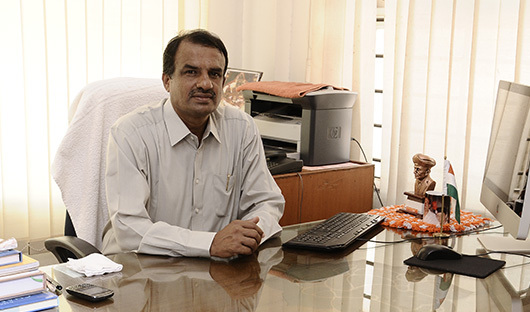 Mr. Manjunath Bhandary is an extra-ordinary visionary, entrepreneur and Educationist. He is the Founder Chairman of “Bhandary Foundation” which encompasses many educational institutions, under the name ‘Sahyadri”. His novel thoughts added a new dimension to the world of education. His dynamic leadership brings about much needed social reforms through education to empower individuals to become the backbone of an enterprising, productive society. A born leader, his skills were honed in the early student days of school and college and opened up vast avenues for him to be recognized as a leader and there by counted among the youth as a youth icon on the global platform. Having attended number of conferences, seminars and workshops round the globe, he had gained deep insights in to the academic as well as socio-economic layers of the civil society, which brought him laurels across the world on various platforms. He received the prestigious Eisenhower Fellowship from the Eisenhower Foundation, Philadelphia, U.S.A., in the year 2004. He had been a part of the youth delegations and took part in various programs around the globe. He was invited by the American Council of Young Political Leaders (ACYPL) to participate in Youth Exchange Programmes, during which time he was witness to the terrorists attack on the Pentagon in 9.11.2001. He was also invited as a special Guest of Honour for the Indian Independent Day parade held in New York, along with high profile dignitaries from both U.S and India. Having deep concern for the poor, rural populace and the weaker sections of the society, he evinced keen interest in several socio-economic projects, proposing viable alternatives and monitoring effective implementation. His vision and entrepreneurial ability had paid off very well in the social empowerment projects. He was instrumental in the government’s ambitious rural welfare scheme called CSCs (Common Service Centers). He proposed a project “Rajiv Vikas Kendra” to the Govt. of India through Hon’ble Congress President Smt. Sonia Gandhi, and same forwarded to Prime Minister Mr. Manmohan Singh to which envisaged providing employment to 10 million rural youth. This proposal was accepted and approved by the Union Cabinet as the CSCs on September 2006, with a total project outlay of Rs. 5743 cores. On the invitation of Indian Government, he attended the world HIV/AIDS conference at Barcelona as Indian delegate, where he joined the prestigious group with the luminaries of the world such as Mr. Nelson Mandela, The President of U.S. Mr. Bill Clinton and other prominent dignitaries., in 2002. Deeply moved by the appeals of world leaders about the need for education among the youth and lower strata of society, he decided to dedicate his resources and expertise to the cause of up-liftment of society and took a firm foot in that direction by establishing “Bhandary Foundation” which has come a long way in a short span of a decade, to become a enterprising entity in the global education.